Eircom in Ireland is embarking on the massed roll-out of vectoring technology and with 150 of its fibre cabinets running vectoring already and the expectation that this will hit 3,000 by the end of March suggests they are happy with how G.993.5 vectoring works in the real world outside of the test labs. Total Telecom suggests that with 700,000 homes in the FTTC footprint currently, that around 70% will benefit from a speed boost to offer services in the 70 Mbps to 100 Mbps region. Ireland has around 1.65 million private homes, so with plans to extend high speed services to 1.4 million premises for 2016, it looks likely that a situation not unlike the UK will arise, i.e. arguments over where the operator has decided to deploy its services and why it is upgrading speeds for those that already can get the faster services. 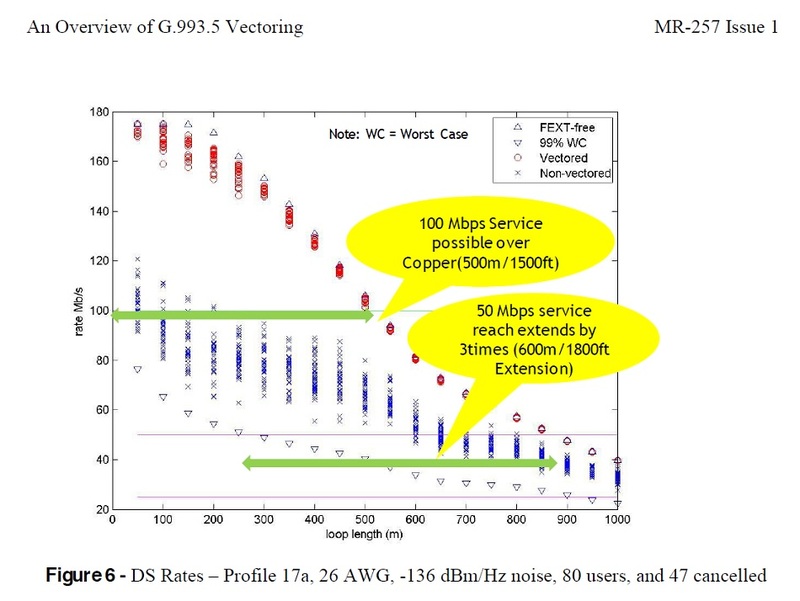 For those wanting to see what sort of difference vectoring can make, then broadband-forum.org has a technical paper that goes into the technical aspects, but we have extracted one of the graphics that shows the benefits while largest for shorter lines does significantly boost the availability of faster speeds. The 99% WC graph represents a worst case scenario for Profile 17a VDSL2 in terms of cross-talk, and explains why as take-up increases in areas people may see speeds dropping away. If the real world deployments can double speeds at 900m of telephone wire from the cabinet, then while this will be complained about as sweating the copper assets it is certainly an improvement worth having. 50 Mbps at 900m is significant as it means that 85% of telephones lines connected to a cabinet can get that sort of download speed. Openreach has been trialing vectoring but it is unclear as to when it might launch or whether the intial trial areas have been expanded. In the context of the UK, the most obvious place to deploy this first would be on BDUK projects as it would, presumably, bring more properties within the 24mbps region using FTTC. One thing that is unclear to me is what, if any, impact there is on modems in customer premises. Do they also need to support vectoring, and if so, do all (or the majority) in an area have to support it? Openreach specifies that modems should support vectoring, and the more that do where vectoring is enabled the better the improvements will be. But why in Ireland? BT are crafty indeed. Really we shouldn't be far of BT releasing a 160Mbps vectoring product so they can compete again with VM for headline speed. @TheEulerID I think this won't help as much as you'd hope for rural areas. Many lines will be well over 1km. Take for example my mum's line, it's 2.6km from the cabinet but 3km from the exchange. FTTdp will be needed for better speed at her address. i get 12-15mb on fttc , id be happy with 20-25 and a low ping with no interleaving. Wonder if the Vectoring technology adds latency like interleaving does. I never suggested it would solve all of them. However, as you are using parental anecdotes, my parent's house is 1.1km from their cabinet, which is in phase 1 of Bucks BDUK rollout. There are several houses further away, and these will be on the margin for 24mbps (let alone 30mbps). Does vectoring improve the service on Aluminium lines? Vectoring removes the noise caused by crosstalk, but not the noise caused by external sources, such as RFI. FEC and interleaving will still be needed to cope with errors caused by those, so we'll still see latency issues arise. I guess they will be needed less, but still needed. G.INP is also being trialled, which changes the way in which modems deal with errors on the line. That ought to reduce the need for interleaving (so improve latency) by adding re-transmission (so increasing jitter). BT seem to have released results of phase 1 of the vectoring trials to ISPs, while also saying that they plan to do a phase 2 of the trials in the same location. Wouldn't say no, given my loop length is about 50m :-) 175mbit? Tasty. to me there is only 2 reasons why openreach delay vectoring, cost and regulation compliance as vectoring makes sub loop unbundling diffilcult. The tech is rollout ready for a while. What is the point? I for one would be happy with no more than 200Mb, (I'm on 153Mb now. 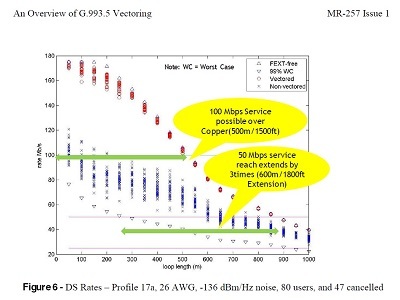 ), and I would prefer VM to focus on connection symmetry so we can have higher up speeds. Starting to see reports of evidence that vectoring is being turned on in Ireland. Isn't the reason that BT is running a phase 2 trial because they want to try Huawei's ASIC hardware instead of the original FPGA? The use of FPGA hardware (ie re-programmable) in the trial suggests that the hardware certainly isn't field-ready yet. And does ECI even have hardware of any sort? How is vectoring deployed? With additional hardware in the fibre cabinet, or software/flashing, or is it done at the exchange? A change in the cabinets, but configured from their operations centre in Bristol, plus there is likely a change to the modems. The cab change requires, at minimum, a change in the firmware for the linecards, to control the vectoring processing on-board. Some changes can be done by adding or changing the hardware in each cab, and it looks like the ECI cabs need a change of DSLAM. The modem needs new firmware, which is downloaded remotely, under BT's control for modems supplied by Openreach. Well that's encouraging then, if the majority of the heavy lifting can be done remotely. New modems...well, I think most customers would accept that. Thanks for the reply - good to know.